My son, Norrin, has been working with a speech therapist for years – ever since his autism diagnosis. At the time he was diagnosed, he had no language or communication skills. Recently, Norrin saw a picture of me that prompted him to ask me 5 appropriate questions in a row. I was beyond excited! Since then, I’ve been finding ways to build on his conversation skills. Tempting as it might be, stop trying to read the child’s mind. 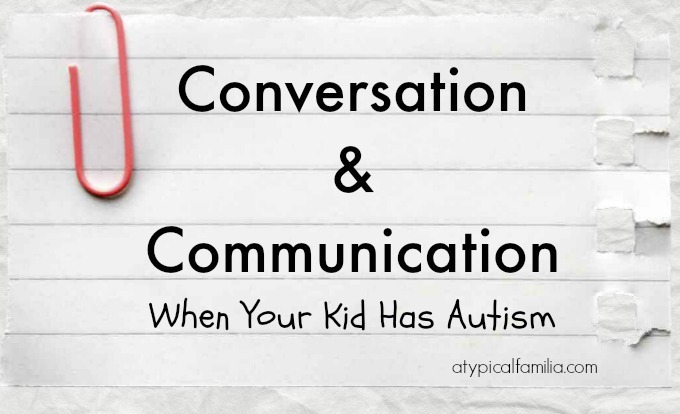 Consider what the next level of communication might be and expect that…expect the child to respond in a way that’s just a bit more difficult than [his or] her current means of communication. I always try to keep that in mind when I talk to Norrin. He’s been much more expressive and so now I expect a little more each time we talk. Make sure your child is relaxed and ready to talk. Turn off all distractions so they can focus on you. And give yourself at least 10 – 15 minutes to commit to giving them your full attention. Go for a walk in the neighborhood and talk about what you see. Sit at the table while they are having an afternoon snack. I like talking to Norrin right before bed. He’s had his bath, he’s winding down and open to talking. 2. Keep it simple and specific. Don’t go into a whole monologue and/or fire off a bunch of questions. Use simple language and ask them one specific question at a time. Conversations are all about the follow up question. Build your conversation based on the answers your child provides. 4. Be patient and wait for response. Some kids need a few minutes to digest the question and think about the answer. So wait a minute or two. 5. Repeat and/or rephrase the question. If you’ve asked a question and too much time has passed. Ask again. If you have to ask a third time, rephrase the question. If they need help, provide two choices or use pictures and have them point. There is inspiration everywhere. Show them a picture of something fun you did together and ask your child about it. Sometimes I’ll point out something as we’re walking around the neighborhood and ask him to tell me about the specific object. It really doesn’t matter what you talk to your child about. The important thing is to take the time to talk to your child and get them into a back and forth dialogue. And with each conversation, always expect a little bit more.